Ocean breezes from the south bathe our saltworks with the taste of the ocean; from the east, north and west, come tastes of organic farms. 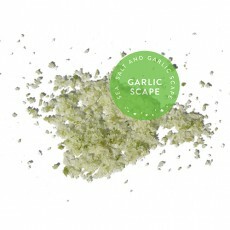 From one adjacent farm comes the scapes that go into this flavored finishing salt. Garlic scapes are the corkscrew flower stalks that grow out of the bulbs of garlic plants. Our neighboring farmer removes the scapes so the energy that would have gone to the flowers and seeds are instead directed to grow bigger, more flavorful garlic bulbs. These scapes, which used to go into the compost pile, go instead to make this wonderfully tasty salt. There is a short window of time when scapes are available, so this blend is in short supply and one of our "limited run blends"
Use this finishing salt blend anywhere a mild garlicky flavor is desired. Linguini with clam sauce, grilled fish (striped bass is one of our favorites! ), flatbreads and pizza are a few of our suggestions.